Venmar Ventilation Inc. has voluntarily expanded its Safety Upgrade Program (SUP) in order to ensure its customers’ absolute peace of mind regarding their product safety. SUP-2006 : Only certain models of air exchangers manufactured from January 1983 up to 2009 are affected by the expansion of the Safety Upgrade Program. SUP-2008 - Light Commercial : This program concerns certain light commercial models manufactured between 1991 and 2007. Venmar Ventilation Inc. has voluntarily expanded its Safety Upgrade Program (SUP) which applies to certain air exchanger models. 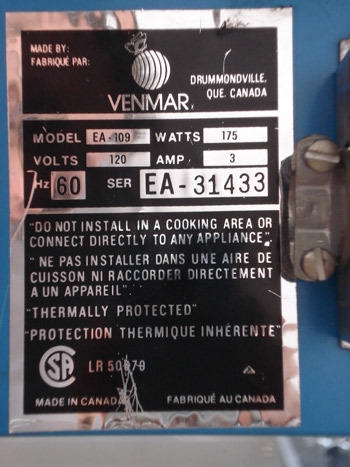 It has come to Venmar’s attention that one of the thermal protections used by the supplier when manufacturing certain of their motors may not operate as intended, which may result to a potential fire hazard. This is a preventive measure that Venmar takes in order to ensure its customers’ absolute peace of mind regarding their product safety. Only certain models of air exchanger manufactured from January 1983 up to 2009 are affected by the expansion of the Safety Upgrade Program. This preventive measure does not cover all the other models not mentioned here. Check attentively the label or the black or silver plate affixed to the exterior wall of your air exchanger. You will find the model number on the first or second line, in bold characters. NOTE: The “X” digit used in the model numbers corresponds to a number OR a letter. For a detailed list of models covered by this program, click here. Check attentively the black or silver sticker or plate affixed to the exterior wall of your air exchanger. On the first or second line, in bold characters is the model number. 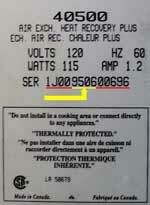 The unit's serial number appears several lines below. This number begins with the letters "SER". The 5th and 6th digits indicate the year of manufacture, while the 7th and 8th digits indicate the month. The remaining numbers are for the company's use. On the third line, in bold characters is the unit serial number. This number begins with the letters "SER". All five numbers are for company’s use. NOTE: In some cases, the serial number sequence may be different. Just make sure you write down the serial number properly, and contact us as soon as possible. It has come to our sister company, Venmar CES, that an unlikely series of circumstances could lead to a motor overheating in specific Heat Recovery Ventilator (HRV) light commercial models that may result in a potential fire hazard. These units fully comply with all applicable CSA and UL standards. They are already safeguarded by circuit protection under both National Electrical Code and Canadian Electrical Code, and by thermal protectors in the motors. Venmar CES will arrange for a qualified field technician to upgrade the units at no charge for the customer. This is a preventative measure that Venmar CES takes today to ensure that all of its customers have total peace of mind regarding their product safety. what should I do if my unit is covered by the safety upgrade program?